The payments report displays a summary of payments, donations, and refunds – i.e. your cash flow transactions – based on the payments and refunds in the system. 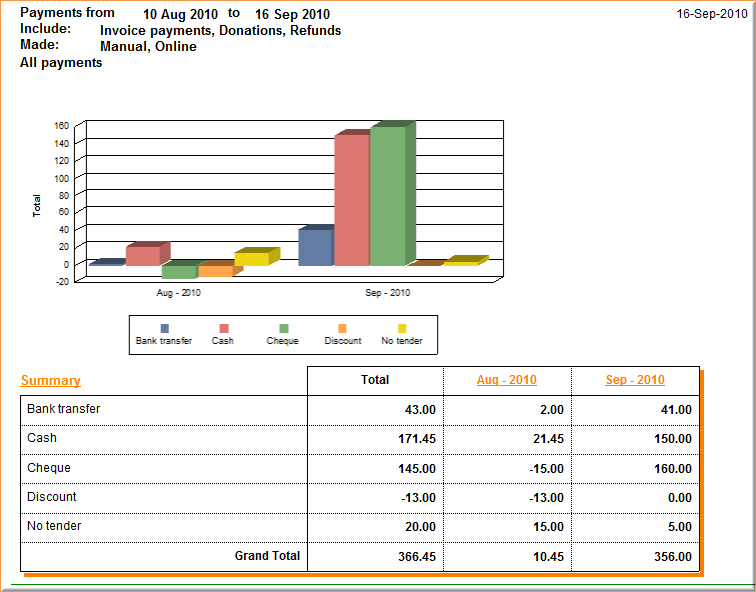 The generated payment report shows a graphical breakdown of all the payments by payment tender. The report is further broken down by invoiced payments, donations, and refunds. Select the date range – when the payments were recorded or made. Select the invoice/payment type(s) you are interested in. You can filter the report by online vs offline payments, payment type – invoices, donations, and refunds – and by payment status – fully paid, partially paid or unpaid.